When fuel is left in a car set for scrap it is going to go to waste, and we all know how expensive it can be. In addition, leaving fuel in the tank is not environmentally friendly, and it will need to be drained. If the car is still safe for the road you can do this by driving around until the tank is almost empty. Alternatively, if you are confident to do so you can drain the fuel and use it in another vehicle. If neither of these options are suitable you can discuss this with your auto wrecker and they will be able to assist. When your car is no longer on the road, the registration (number) plates should be removed. You can either do this yourself or ask the wrecker to help prior to them taking ownership. To end your registration you can surrender your number plates at your local motor registration centre. 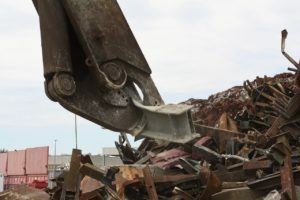 This might sound obvious, but before you sell a car for scrap (or any other reason) you should thoroughly check for any personal or valuable items. This might include money, clothing or electronics. Double check the boot, glove box and other compartments just in case. Once it’s gone…it’s gone! The process of selling your car to an auto wrecker might vary slightly to a private sale, but one thing it has in common is your expectation of a fair price. Do your research to determine what it is worth. You may even need to get more than one quote, and use your haggling skills. If this was your main car you will need to work out how you will get around. Was your car written off and a replacement arranged through insurance? Will you be wheel-less and rely on public transport? Or, do you already have something new? Your ability to get from A to B needs to be considered. When you are the owner of a vehicle, often you are paying for more than just the registration. Your insurance policy needs to be transferred or cancelled, and you might need to update your roadside assistance. If you have paid up front you may even be entitled to a refund. Your car wrecker in Perth will want to have proof that the vehicle is in your name. Make sure you have all of your paperwork ready and be prepared to transfer ownership. More information can be found at the WA Department of Transport. Selling your car to the wreckers for scrap is not complicated, and when you do the right preparation it will speed up the process. The condition of your car will determine how it should be transported, and this is often with a tow. Contact us today to discuss your car wrecking needs. ← What Do Car Wreckers Do With Your Car? Copyright © 2019 Advanced Auto Wreckers. Powered by WordPress. Theme: Ample by ThemeGrill.